IT’S taken them three days to get here but the members of a convent in Belarus aren’t shaken by their journey. For now, in their sixth year, the brothers and sisters of Saint Elisabeth in Minsk are well-versed in what it takes to be Christmas market stall holders. Stopping at Poland and Germany before arriving in Winchester last week, the team have set up shop ready to sell religious orthodox paintings, crafts and traditional Eastern European pieces. This year, manning the little hut tucked away at the back of the cathedral’s inner close is Oleg Kavalenka, a 33-year-old part time IT teacher, whose obedience with the sisterhood specialises in working with children. “Many people who do have families come out to do good here and that’s what the sisterhood tries to do,” he said. “For me, this is the most important part of my work; to provide for the children. Their stall in Winchester is just one of several dotted around the UK, including Salisbury, Bath and Oxford. 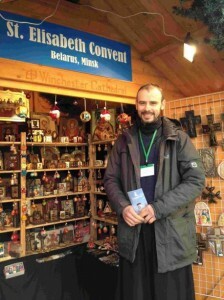 Oleg is one of seven convent brothers and sisters who travelled to the UK together after packing up their minibus with glittering matryoshkas and pictures of the Virgin Mary to sell to fund their convent in the small village of Novinki. The convent was founded in 1999 and named after Queen Victoria’s granddaughter Princess Elisabeth who was canonised by the Russian Orthodox Church in 1981. It provides traditional shelter to a range of people including the homeless, sick, orphan children, the mentally ill and recovering drug addicts.